Description: White boiled egg wedge with a rounded section of yellow yoke in the center. One side of the egg has an imprint marked, "KOREA". Measures 2-1/8" long x 1-3/8" wide x 1" tall. Description: White egg bottom half. This is the bottom half of FPT7510 top egg half. 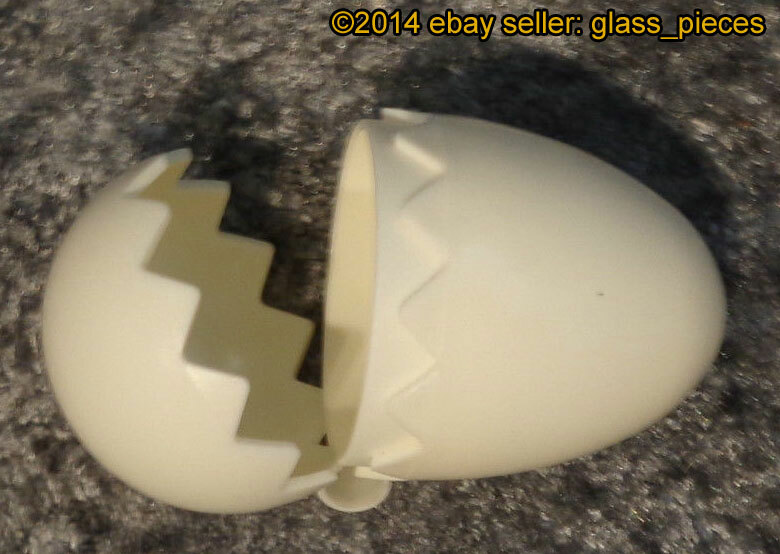 Description: White egg shell with an attached top and bottom half with jagged edges around the open ends. Description: White egg top half with a smiley face on it. The face has blue eyes, a pink line smiling mouth, and pink cheeks. This is the top half of FPT7511 bottom egg half. 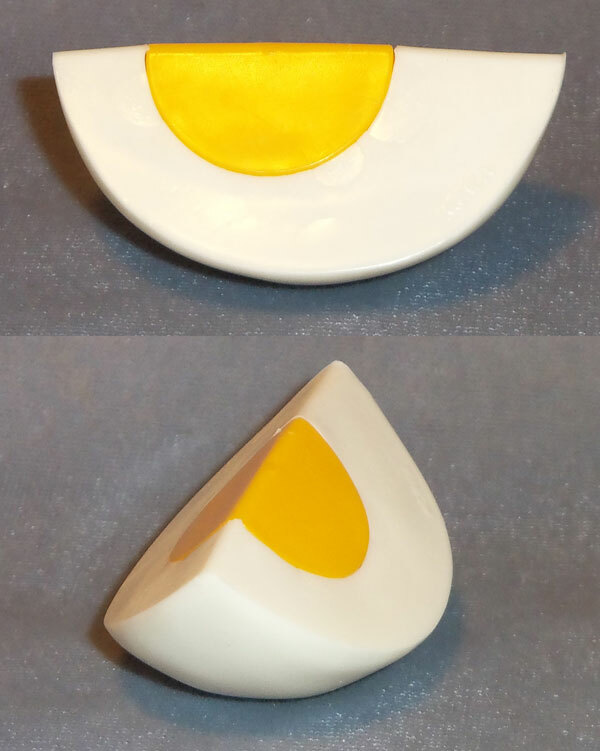 Description: White plastic "sunny- side-up" fried egg with a round yellow yoke in the center. Back of mold has no design (smooth) and marked "KOREA" in the center. Measures 2-1/4" long x 2-1/8" wide x 1/8" thick. Description: Disc-shaped 2-sided eggs and bacon. 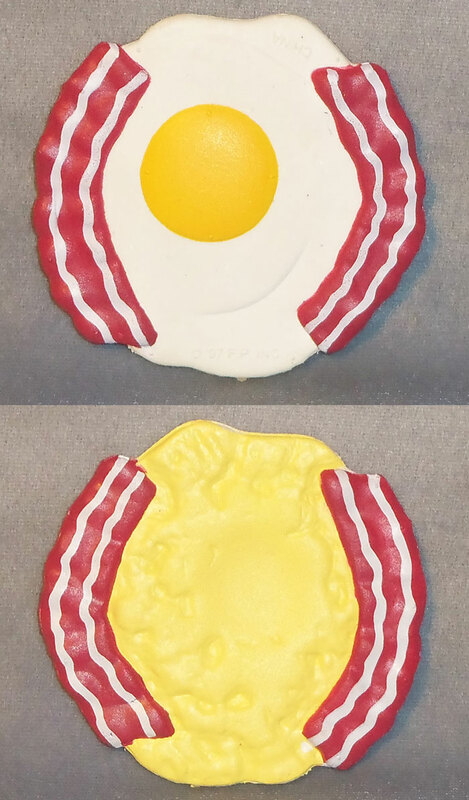 One side is white (fried eggs) with a round yellow yoke in the center, and 2 light brown strips of bacon attached to the sides. Other side is yellow (scrambled eggs), and 2 light brown strips of bacon attached to the sides. Fried egg side has an imprint marked, "©97 F.P. INC" and marked, "CHINA". Measures appx. 3" diameter x 1/8" thick. Description: Yellow rounded plastic scrambled egg textured to look like real scrambled eggs. Inside is hollow, open, and marked, "KOREA". Measures 2-1/4" long x 2" wide x 3/8" tall.